Full-fused silica objective lenses offer minimal absorption and are ideal for high-power and short-pulse applications. 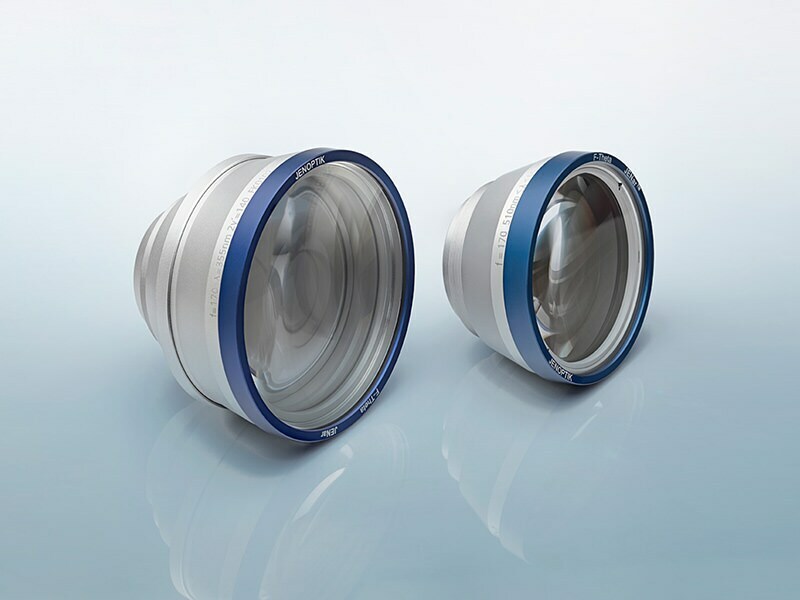 Silverline™ F-theta objective lenses from Jenoptik have been specially developed for applications that use high-power and short-pulse lasers. They are fused silica objective lenses that offer minimal absorption for extremely powerful lasers. The F-theta objective lenses in the Silverline™ series are available for applications from 1030 to 1080 nanometers, from 900 to 1100 nanometers, 355 and 266 nanometers. The objective lenses are diffraction-limited and provide a high level of image quality. They also offer a significantly higher damage threshold and a high spot consistency over the entire scanning range. The Silverline ™ objective lenses can handle a beam power of up to four kilowatts without active cooling. They guarantee a minimal focus shift for extremely powerful lasers. We offer the F-theta objective lenses as a standard selection or can adapt them to meet your exact requirements. The F-theta Silverline™ lens 170-355-140 in the wavelength-range of 355 nm. It has a maximum telecentric angle of just 4.9 degrees and a highly homogeneous spot size distribution across the whole of the 100 x 100 mm work area. This large processing area, in combination with the diffraction-limited image quality, allows for increased throughput in comparison with standard lenses available on the market. We can ensure the level of precision necessary here by means of the high-quality optics employed, a new patented mounting technology. Each objective lens undergoes a standardized application testing procedure. This guarantees highly consistent optical properties throughout series production. Find the right F-theta lens suitable for your application. 1) New product variants for NIR diode lasers of Silverline™ F-Theta lenses. Coating is specified for 900 nm…1100 nm instead of 1030 nm…1080 nm for the broader spectrum typical of diode lasers. The values given are nominal values for the specified application parameters. Jenoptik provides Zemax ® BlackBox files for simulating application results for customized parameters (e.g. wavelength, scanner geometry, beam diameter, ...). Back working distance, Flange focus distance, and focal length vary by ± 1.5 % due to manufacturing variances. JENar™ F-theta objective lenses are suitable for use at laser wavelengths of 1080 to 355 nanometers.